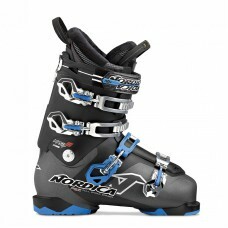 Comfortable, weather resistant and lightweight, the NGRY boots will take you anywhere on the mountain you want to go. The adjustable cuff alignment, adjustable flex and Nordica’s storied all mountain 100mm, makes the NRGY 6 your all day all mountain boot. Providing the best possible traction for hiking in the backcountry or up to a rail set, or simply just navigating your way around the lodge. An ALL NEW overlap system integrated into the shell provides a full waterproof feature to prevent water from leaking into the boot. And as we all know, dry feet are warm and comfortable feet! A NEW advanced Polypropylene formula exclusive to Nordica provides a 25% shell and cuff weight reduction compared to any other high performance or race boot in the market. TRIAX has a more consistent behavior within a wide range of temperatures and is easily workable by boot fitters. For superior traction on hard surfaces and stair treads, we’ve got you covered. Also with our new toe and heel technology Nordica is able to offer a quick canting solution of plus or minus 1 degree for our boots. This is an after market option.